Park City, Utah-based Backcountry.com is a great example of the powerful growth in the online e-tailing sector. Twenty years ago the company comprised of two men, a stack of avalanche beacons, and a garage in Park City; the company has grown to become one of the leading online specialty retailers in the United States, selling clothing and outdoor gear for hiking, camping, road biking, mountain hiking, rock and ice climbing, mountaineering, skiing, avalanche safety, snowboarding, fly fishing, kayaking, rafting, road and trail running, and more. 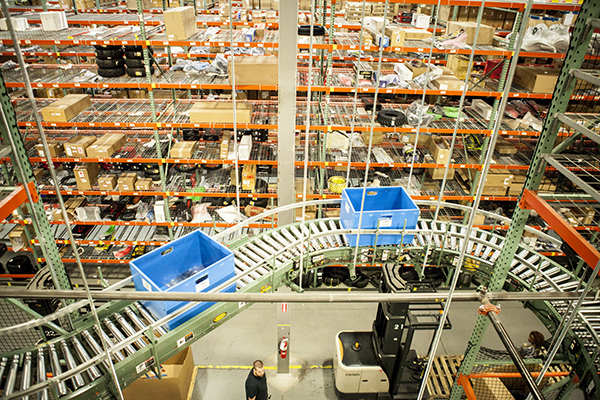 When Carter started with the company in 2001, it shipped 265 packages on its busiest day. This past year, the company shipped about 60,000 on its busiest day. The journey has involved quite a transformation in material handling and distribution. The role of automation has made this all possible. When Carter came on board, Backcountry.com was doing its distribution through Excel spreadsheets. Before the company opened up a distribution center in Salt Lake City, Carter was tasked with building a warehouse management system (WMS) in open source that subsequently was named Interchange. It was the first major step towards the modern distribution system currently employed by the company. As with many fast growing e-commerce, online retailers, Carter started thinking about the difference between direct to consumer distribution and distribution to a traditional retail network. 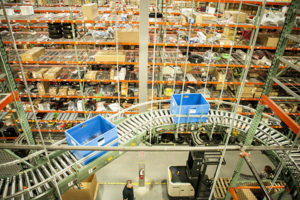 The WMS and material handling system came together at Backcountry.com’s 325,000-square-foot distribution center in Salt Lake City, established in 2005. The first system we installed for them was a pick and pass system noted Westover, who is now automation omni-channel distribution and fulfillment specialist with Hoj. The biggest challenge to that system was scalability; when the project started, Backcountry.com had only a small number of SKUs; but today they have more than 500,000 SKUs, with 350,000 on hand at any one time. The initial pick and pass system worked well, but once the company surpassed 200,000 SKUs, it started bogging down a bit. Corrective automation actions were taken such as implementing things like early out; instead of making an order go through every zone, it could be taken out of the system and routed to packing. The system developed for the first distribution center (DC) was very complex, with all the features to make pick and pass scale through half a million SKUs and the e-tailer learned a lot in adapting the system over the years to accommodate growth, internally on the WMS and with Hoj on the racking and space utilization front. This experience would prove invaluable as Backcountry.com moved forward in designing a new more robust automation solution. The company’s growth led to the decision to open a second distribution center in Christiansburg, VA, to handle the East Coast of the United States. The company negotiated and found a location to build a 300,000-square-foot facility, with the potential to expand to 400,000 square feet. Hoj returned with an original racking and flow system using vertical lifts instead of diverts; this automated process ensured the routing was from pick to pick, rather than picking and passing through zones. Totes go from each pick to the next pick to the next, using a “three-dimensional” process. An order is started in the pick module, and when everything in that order has been picked in a zone, it’s taken out of the system. The order is run through a sort. If the order is complete, it is sent to a packing station, then routed to the appropriate pack line. If the order is not complete, it’s sent back into the pick module. In the center of that module is a sorter that runs through the center of the DC, a “spine delivery system.” It goes right down the center of the unit, where it is diverted to the zone it needs to go to for further work. So instead of having to wind its way through all the zones, it goes directly to the next zone required. Since the pick module encompasses three levels, 10 vertical sorters serve six zones. Because there’s a right and left on all three levels, there are 60 zones (10x3x2) a tote can go directly to without having to pass other zones. The Virginia facility went live in 2012 without congestion and is now handling 54 percent of the company business. Multiple item orders are working faster and are easier to process in Virginia because of the three-dimensional direct-to-zone pick design. Orders in Virginia are processed and completed 20 percent faster than in Utah. The new facility is 20 percent more efficient on a cost-per-order basis.